VetUK Cat Wormer Film Coated Tablets are indicated for the treatment of mixed infections caused by gastrointestinal roundworms and tapeworms in cats. Suitable for cats and kittens from 6 weeks of age and over 1kg in weight, the tablets have been given a delicious meaty flavour to make them more palatable and although they should be given directly, can also be disguised in food if necessary. In cases of Ascarid infestation (especially in kittens), complete elimination cannot be expected. Therefore, repeat treatments should be carried out with a suitable roundworm product at 14 day intervals and until 2-3 weeks after weaning. I thought our cats had a worm investigion as they where so extremely hungry- even the cat that normaly only eats little was gorging itself. After the treatment the bith improved & started eating more normaly - i think that this showed they had worms & afterwards did not; so I conclude this works & I keep using it at recommended times. These have worked wonders for my cat who was obsessed with food and scavenging. He was constantly howling and pestering for food whenever someone was near the kitchen. We gave him the worming tablet and another 2 weeks later and he is a different cat. He is no longer under our feet in the kitchen, not up on the worktops, he can relax and isnt obsessed with scavenging any longer. The amount of mice etc he has brought in has thankfully reduced too! These are great tablets, same ingredients but at a fraction of the cost of the branded ones. This is a great product and you don't have to pay an exorbitant price. Our cat was showing no signs of having worms but in less than 24 hours of taking the tablet one appeared in his faeces. So glad I bought this product. Thank you. TRES EFFICACE mes chats le prennent assez facilement et le prix est raisonnable. 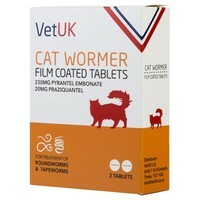 These wormer tablets did the same job as the droncit ones I normally use for my three cats. The product is good but the packaging is extremely wasteful. I could not believe that there is a box and leaflet for every 2 tablets. In this world of trying to cut down on packaging I can not see why this is necessary. VetUK: thank you for your comments and we agree. Unfortunately the quantity of tablets per box is stipulated by the VMD and as such we must adhere when having them manufactured. I give this product 5 point. Our cats are very pleased with the coating. Even our great snowshoe has not put up his usual fight.